The first items are these snazzy Flash cufflinks. These little guys made it to the wedding and were actually bought just about three months ago specifically for the wedding. Truth be told, there isn’t a lot you can say about cufflinks. 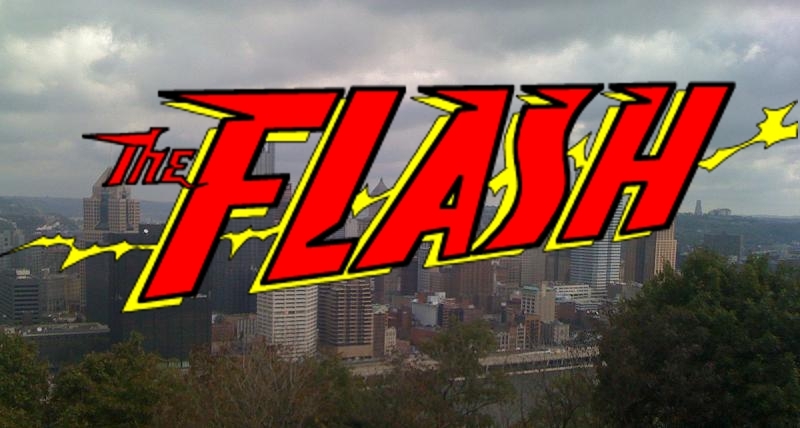 They rock the Flash logo, with an extra bit of red so the lightning bolt isn’t jutting out. They went over really well. Especially since Brandon was wearing his Green Lantern ones. Even all dressed up our geek was strong. If you are looking for a pair yourself, be careful. For some reason I’ve seen them online priced in the mind 20s and then on other sites at 50+. Not sure why there is such a difference, but my 20 dollar ones worked perfectly. The next item didn’t make it up to Pittsburgh unfortunately. My Fossil Flash watch. Or is it my Flash Fossil watch? Anyway, the night before we were leaving I was packing everything and noticed the batteries were dead. I popped the back off thinking I’d run to the store and grab a battery. The insides looked delicate enough I decided I’d let someone else do the replacement so the watch stayed at home. Fossil made these in 2006 as part of their Vintage Superhero series. I know there was also a Green Lantern watch. I’m pretty sure there were Batman and Superman ones too, because you know they have to be included in everything. You can see in the pictures that they only made 2000 of the Flash watches, mine is numbered at 400. I have to also point out that the case the watch came in is amazing. Clear sides with the Flash logo printed across it. On top of it is a raised Flash symbol. Fossil obviously knows how to make some outstanding packaging. While I keep my watch out of its case so it can be seen, I have kept the case on my Flash shelf because it is so nice looking. This was the last of the wedding recaps, so tomorrow is back to normal around here. Next week we’ll dissect a Flash Cake. Yah, I had to get the batteries replaced on my Flash Fossil watch as well. I took it into a jeweler and didn't see my watch for two weeks after that. They were able to get the lid off the watch but were unable to put it back on at the shop. Because of the delicate nature of watches and the crystal on the case etc. They decided to send it off to a specialist. I had no problems with that. I have watch number 878/2000. It is a great timepiece and the hands and the hour marking glow in the dark. There is a Fossil store not that far from me, I'll be heading there soon. Glad to know I'm not the only one that had trouble getting the back piece back on. Flash cufflinks! Had no idea they existed.